I just had the chance to visit a lovely shop in Syracuse, NY, just a few miles away from Syracuse University. We are up here doing college visits for Maddie and this was a great diversion. The exterior is a little deceiving as you can’t really see inside and there was minimal signage. I was a little discouraged at this point but should know better than to judge a book by its cover. When you get to the door it becomes immediately apparent what a great shop this is. 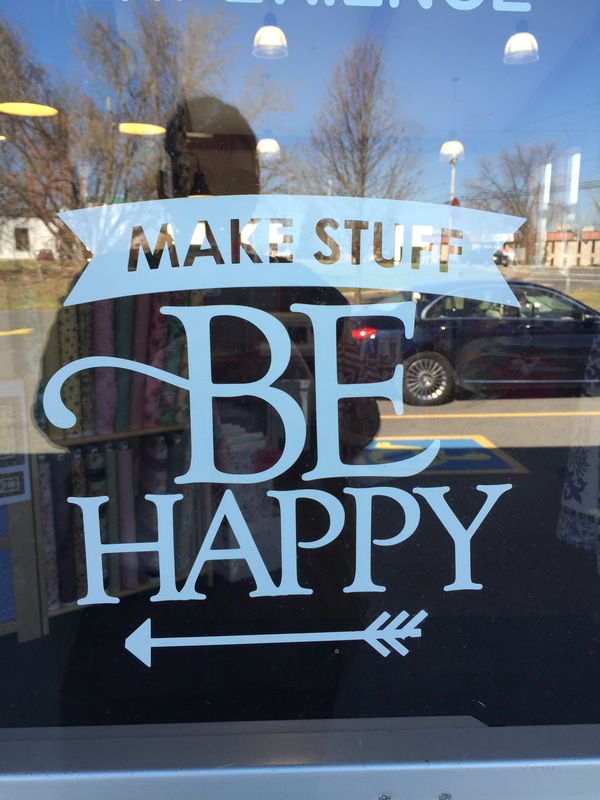 The door sign, “Make Stuff, Be Happy” just about sums it up. And this sentiment is carried out throughout the shop via the fabric, the decor and most notably the staff. They were all very friendly and helpful. They have a wide variety of fabric – 2,500 bolts if I had to guess – that spanned modern and traditional, solids and prints, basics and batiks. The fabric was arranged on smaller shelving units than I normally see which I quite liked. Somehow it made it easier to see the selections. They also have Baby Lock and Elna machines, Koala cabinets and all sorts of patterns, threads and other notions. 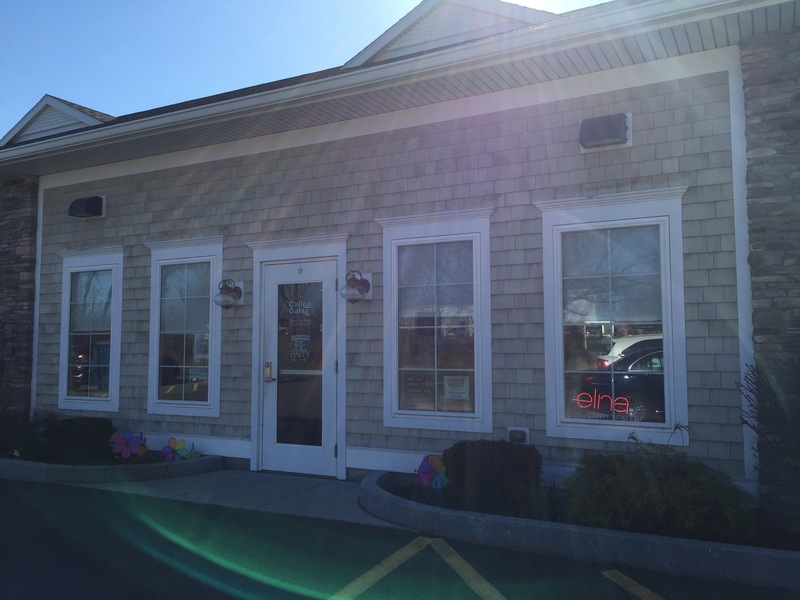 You could easily walk in, find a project and get everything you need. 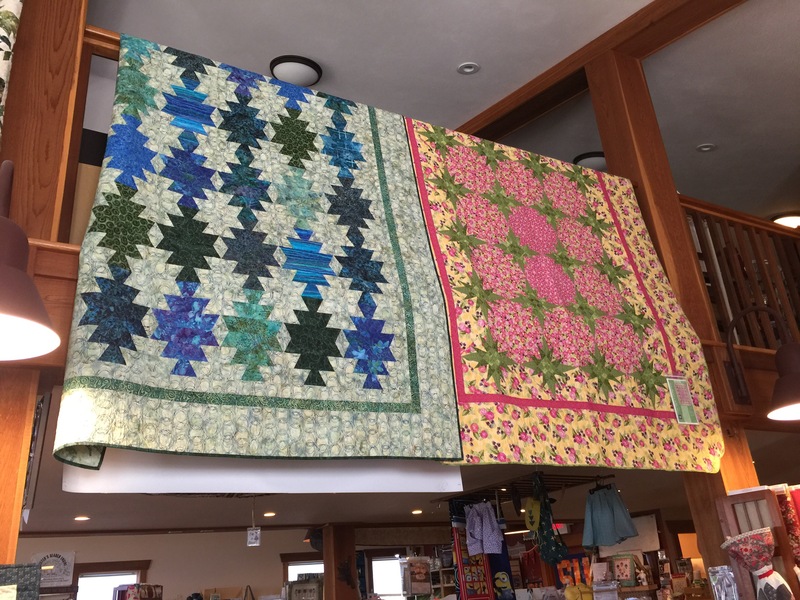 The staff here do beautiful work as you can see by these quilts they have on display. There were many other projects around the shop but I didn’t have a lot of time. And of course I bought fabric. This shop also has the claim to fame of having started the row-by-row experience that included over 2,500 quilt shops last go-round. I need to learn more about that. 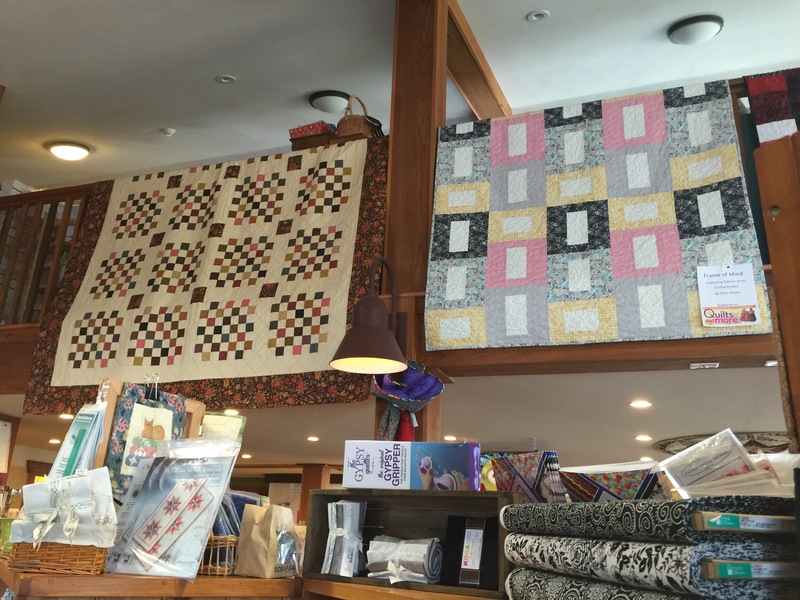 At this point, the quality of local quilt shops is not a college selection criteria (but it should be.) That is too bad as I loved this shop and hope I get to come back. If you are in the area definitely try to visit.